I discovered concealer by accident. Someone had sent me a pan of Benefit Boi-ing Concealer but at the time, I was not so familiar with makeup, and had no idea what a Boi-ing was. So, I tossed it in my drawer and forgot about it, until one day when I came across it again. A quick Google search told me it was a concealer by Benefit Cosmetics and another quick Google search taught me how to apply concealer. Voila! With concealer, my eye circles from late nights had magically disappeared! I looked fresh, bright eyed and bushy tailed, ready to tackle yet another daunting work day! 🙂 Next, a dab on concealer on any blemishes or uneven pigmentation and suddenly, flawless skin! Now, concealer is indispensable for me. Let me show you the difference having concealer on makes to the under eye area. Be warned, scary untouched up pictures ahead! The picture before is a moisturised face with nothing on. I woke up with tired looking eyes and reddish circles under the eye. The picture after is with just a layer of Make Up For Ever lift concealer on, without applying any foundation/powder yet. Purely untouched up photos. 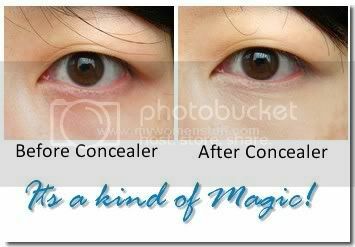 They say best how magical concealer truly is! I went from Boi-ing to L’oreal Touche Magique (discontinued) to Make Up Store’s concealer to currently Make Up For Ever Lift Concealer. With every concealer I use, I use it the same way – with my fingers. I find that when I use my fingers, the heat from the skin helps the concealer blend better and reduces the problems of streaking. It also results in less concealer being used compared to using a brush. I usually dab a few dots of concealer under the eye to conceal dark circles, then lightly tap with my fourth finger to spread and blend. Make sure you dab instead of pulling or you risk pulling the skin and causing wrinkles to form. When choosing a concealer, I read that you should choose a color which is as close as possible to your natural skin colour, just as you would choose a foundation. Apparently, the old tip to choose a colour lighter than your natural skin colour is now less advisable because you risk looking like a reverse panda – having light circles around your eyes. If your concern is brightening the eye area, then go for a concealer that conceals and brightens. These usually contain an element of shimmer to reflect light. I’ve heard a lot of good things about Yves St. Laurent Touche Eclat, for a brightening concealer but have not been able to bring myself to try it due to the high price tag! 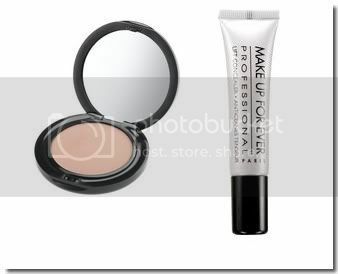 For blemishes, I use Make Up For Ever Full Cover Concealer (nothing beats this!) and apply the same way – dab and tap, covering and concealing to satisfaction. The nice thing about Full Cover is that it can be applied on top of foundation so if you feel the need to conceal further after applying foundation, it works too. However, I’m not overly particular about some blemishes showing through. To me, it adds a human element to a person because no one is flawless, so I don’t over conceal. An online friend, Giddy Tigress, does the same thing I then do which is to let the concealer set for a bit before applying powder. This ensures that when you apply your foundation or powder, it holds better and the concealer doesn’t get wiped away. If you don’t like using your fingers, use a brush with synthetic bristles. Shu Uemura #10 handy brush is good for this. It has a short handle and is just the right size. The tip of the brush tapers to allow it to get into corners. A brush with synthetic bristles won’t absorb the liquid like natural bristles will. Work quickly but gently to avoid pulling the delicate skin around your eyes and on your face. Makeup should enhance your looks, not age you! You can read Viva Woman’s tips for under-eye concealer too. Do you have other tips for applying concealer? RE: YSL Touche eclat, it’s a hit-and-miss thing sometimes. If you’ve got chronic dark circles, the touche eclat would give it the ashy look, not what you’re after.if you’ve got light dark circles, then yes, this would work. This has worked for me on certain days and not on other when the dark circles are extremely severe. The other one that’s similar is Dior skinflash. It’s pinkier than touche eclat and the ashy factor is more apparent. Can’t wait to try out MUFE! Your post came just in time as I’m looking for a useful concealer 😉 It’s definitely great help! I’ve read your previous post about MUFE concealer, I’m going to get one tube..hehe. Geekchic: Ah! the perils of light concealer/foundation on darker skin. Ashy colors. Its looking like a zombie vs looking like you didn’t sleep well. Glad to read about the experiences of a YSL user! Natallie: Thanks and I hope it works for you! i just have to say that without my Make Up For Ever Full Cover, i look like a spotty cat! gotta try it out! I’m so interested in MUFE’s Lift Concealer now that I’ve seen your before / after photos! Oh PB, my makeup stashes are growing by the leaps and bounds ever since I read your blog faithfully! Hahaha… thank you for your kind words, but I had my regular makeup on therefore you couldn’t see the flaws! Teeheehee. Had to look good also mah… meeting the beauty bloggers – you n Beetrice. Thank heavens for the creator of concealers :p I still haven’t found THE concealer for me though. I’ll definitely check out the MUFE one when I go back to M’sia in Sept.
PS: Hey do another blogger meet-up thing lah. I wanna meet up with you guys!! My dark eye circles isnt my biggest problem.. it’s my acne scars. Very often, whenever I get a pimple, even though I religiously apply pimple cream, not picking the pimple, it will always leave a scar. To make matters worse, I have acne-prone skin. Try so many concealers already.. I havent really find one that can really conceal and stay concealed! Maybe I should try this one out, ya? Then again… where is it sold in Singapore? I’ve heard of this brand.. but never see it anywhere.. Anyway, recently there’s a hype on Blemish Balm cream (aka BB cream) in Singapore. Have you tried any?